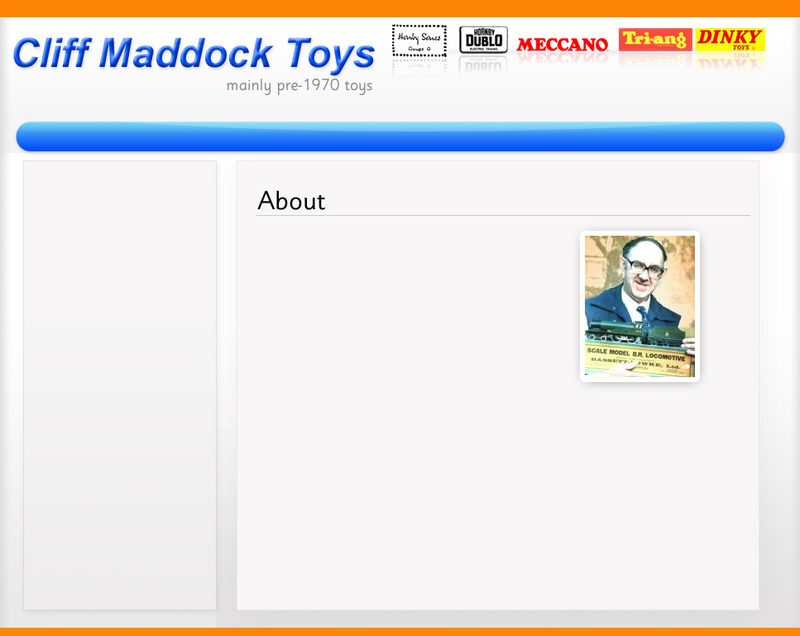 Maddock Toys is the Internet trading name of the business founded and operated solely by Cliff Maddock. The business operates in the sphere of selling, buying and exchanging mainly pre-1965 toys and models of all descriptions. The business specialises in all the products of the famous Meccano company which operated from Binns Road, Liverpool until closure in 1979. These products include Hornby 0-gauge trains, Hornby Dublo 00-gauge trains, Dinky Toys, Meccano, catalogues and paperwork of all descriptions. In addition to this specialised area, Maddock Toys deals in other makes of toys and models such as Bassett-Lowke, Bing, Tri-ang and other model railways, Triang 'Minic' clockwork road vehicles, Mamod, Bowman and other steam engines, and many other types of product such as jig-saw puzzles and cigarette cards. A particular interest lies in the subject of the 'Eagle' boys weekly of the 1950s and 1960s. A separate sales list of 'Eagle'-related material is available and Cliff is keen to acquire anything related to this publication. Please contact him if you have items to sell in any of the above fields of interest. Anither area of Cliff's interests is that of the 1951 Festival of Britain, held on the south bank of the Thames in London and in Battersea Park. If you have any memorabilia relating to this exhibition he will be pleased to hear from you. Cliff Maddock is also interested in acquiring any period merchandise relating to the A.A. (Automobile Association) and the R.A.C. (Royal Automobile Club). Maddock Toys is based in U.K. and has an established world-wide customer base. Cliff Maddock is a lifelong enthusiast and collector of toy and model trains and many other collectables relating to bygone years. He has been collecting for over 40 years and has been trading in toys and collectables for over 20 years.